The only microgranule that releases Oxygen in presence of asphyxiated soils and water stagnation. MICROSEED AIR O2 is microgranular fertilizer based on nitrogen, phosphorus and zinc in combination with Peroxide which releases Oxygen when met the soil moisture. 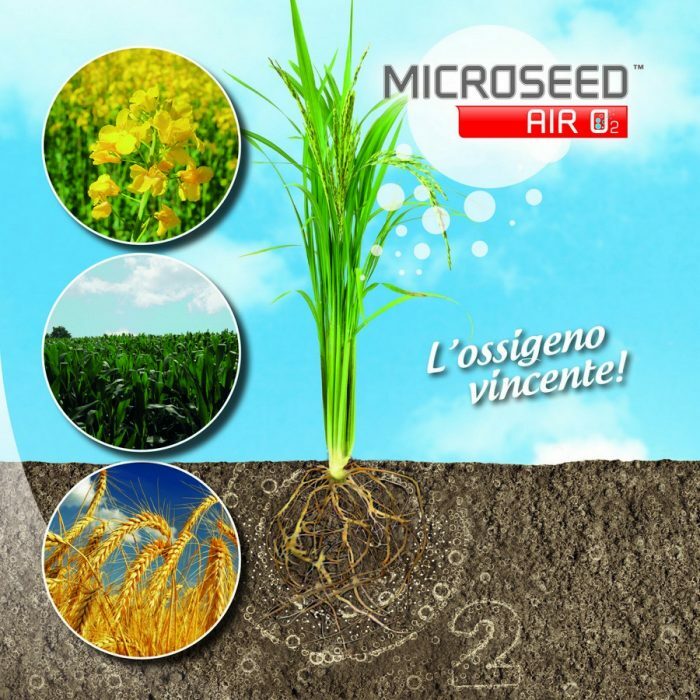 MICROSEED AIR O2 creates an AIR BUBBLE around seeds and around roots system for reduce the asphyxia and roots anoxia phenomena, stimulate germination and rooting in difficult soils (eg. clay soils, soils with water stagnation and compact soils).It generate an oxidising action against soil microorganisms. MICROSEED AIR O2 is characterized by spherical, compact and sliding microgranule with 0.3-1.0 mm diameter, that it’s ideal for located fertilizing during seeding and transplanting. Phosphorus is protected by an organic matrix that is combination with Zinc appears to be completely available for development radical.